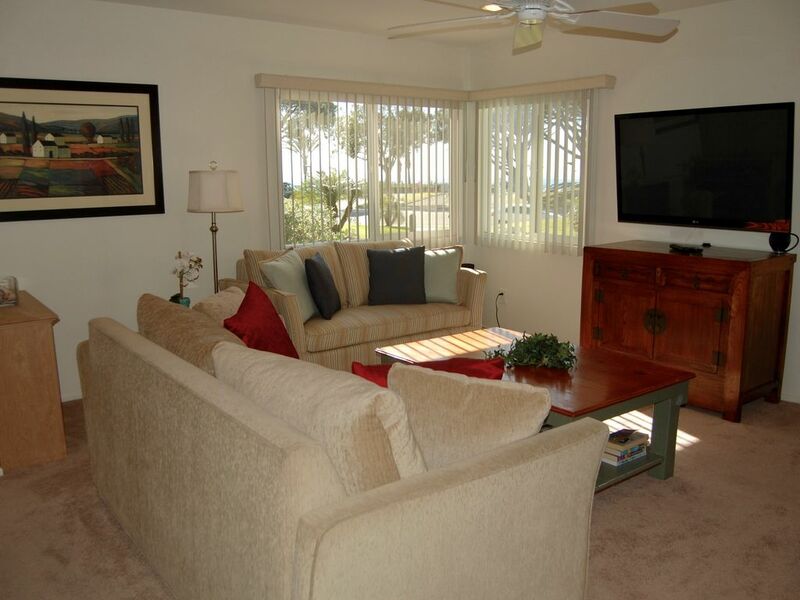 Coastal Accommodations: Fun, Romance, Steps to Beach, Ht'd Pool, Ocean View!! Relax, have fun and enjoy a leisurely stroll along the water’s edge while staying in luxurious comfort at Coastal Accommodations. This two bedroom, two bath, ocean view Headlands Reserve condo is across from the Coastal Access and two of the most beautiful beaches in Southern California, Strand and Salt Creek. Gorgeous scenic pathways make them literally only steps away. Don’t feel like walking? Take the funicular tram. Soft, wall to wall carpeting in the main living area and bedrooms compliment eclectic furnishings of traditional and teak with antique Asian accents, offering quality comfort in a soothing aesthetically pleasing environment. Two garden patios provide a peaceful private setting for quiet enjoyment after a full day of sightseeing, parks, boating, golf or just sunning at the beach or by the heated pool. The kitchen is fully equipped to serve any occasion and the dining table opens to comfortably seat up to 8. Coastal Accommodations sleeps 6 with a topper padded king in the master bedroom, full bath and walk out shared patio. The guest bedroom has a private patio, topper padded queen and separate full bath. Living room offers extra sleeping in a Carlyle convertible custom long queen sofa or oversized twin loveseat. A futon chair opens to a twin for small children or young teenagers. Coastal Accommodations is centrally located near communities and attractions suitable for all ages and interests, be it cultural, artistic, sports or recreational. Dana Point Harbor is right around the corner and home to the: Ocean Institute, Tall Ships Festival, Brig ‘Pilgrim’, educational programs, tours, many water activities as well as restaurants, shops, boating, whale watching, Catalina cruises, summer concerts, and more. Golf is right next door: St. Regis Monarch Beach Links public course (3 min) and the nine hole Aliso Creek (7 min); or pamper yourself at one of the many day spas. Gourmet, Super and Farmer’s markets, interesting shops and boutiques, as well as innumerable restaurants, from casual to formal are all nearby, each offering their own unique menu that cater to a variety of palates. Coastal Accommodations offers all the luxury and convenience that ensures a thoroughly pleasurable vacation. 30 night minimum stay required. I am the original owner of 'Coastal Accommodations', and after 8 years of residency in Southern California, returned home to the East Coast. I'm since married with 2 children. Much thought went into making our home away from home as comfortable as possible, and we hope you find it to be so too. I chose 'Coastal Accommodations' for its location, beautiful ocean view, short walk to Strand & Salt Creek beaches (and now the nature preserve); as well as its close proximity to Dana Point Harbor and other neighboring resort communities including Laguna Beach, San Juan Capistrano, and San Clemente. toilet, combination tub/shower, Limestone counter. Extra deep privacy curtain on tub/shower. A main landline phone w/ answering machine in kitchen counter. Wireless broadband high speed internet is throughout the condo. Offers wireless internet hook up to Droid, I Phone and Backberry users. Depending on your cell service, reception could be anywhere from poor to excellent. Additional parking is close by, across Selva Rd. A reserved covered carport space conveniently located near the condo. Well maintained free park parking area just across Selva Rd. Telephone service includes free local and national calling anywhere in the United States. Complete set of pots and pans, cookware, serving pieces, mixing bowls, cooking utensils, Crock pot, Blender. (Portable Charcoal Grill in Patio Closet w/ lighter fluid). Mr. Coffee Drip Coffeemaker, suger/creamer, whole bean coffee grinder and french press. Complete set of tableware/linens and serving dishes for service up to 8. Fully equipped kitchen: new cabinets, granite countertops, electric oven/stove, coffee maker, toaster, coffee bean grinder, blender. Cable TV 50' Flat Screen in Living room. 32' wall hung LCD TV in guest & master bedrooms. Stereo receiver/ tape/cd/player w/ 2 speakers. Audio speakers also connected to flat panel tv. Recently underwent complete renovation and is the only heated community pool in the local area. Recently renovated and comfortably constructed and sized. My family really enjoyed our stay. The owner was wonderful and made sure we were welcomed to a clean and organized condo. The area is outstanding - plenty of walking paths, Strand's beach, and close access to both Dana Point and Laguna Beach. This condo was everything that we were looking for! We really lIke our recent stay at Anna Norden and we'd love to come back. we stay 4 more days. Condo rental was A+. To start - the location is amazing, directly across the street from the beach with boardwalk access. You just walk right down the stairs to a beautiful beach. Condo was clean, there was instructions for everything, and plenty of space to host our group. Looking forward to coming back. It is always a pleasure to know how much guests enjoy staying in Coastal Accommodations and Dana Point. Thank you. The owner was wonderful to work with, and the property is extremely well maintained and furnished. With amazing views from the patio and living room - and even better views just a few steps away, overlooking Dana Strand beach - this was a wonderful place to get away from the polar vortex this winter. There is easy access to Strand and Monarch beaches, Dana Point town and harbor, golfing, Mision San Juan Capistrano and much more. The owner provides a handy guide book with information on local attractions, restaurants, churches, etc. Dining options range from high-end fine dining to our breakfast favorite - Coffee Importers on the harbor. This is a great getaway, and while the pictures are completely accurate - they pale in comparison to actually being there. We totally enjoyed our time here. The location was perfect. The accommodations were great, comfy beds, fluffy towels, all the little extra amenities were there. The place was very clean. I would absolutely recommend it to a friend. My daughter and I stayed at this condo for a week. The location was perfect for visiting my son and grandchildren, who live in Dana Point. It was also perfect for a short, lovely walk to Monarch Beach and easy driving distance to Laguna Beach and San Clemente. The condo was well-appointed, quiet, and very comfortable. The only difficulty was that neither of the available DVD players worked. The owner was pleasant to deal with, and I would definitely stay there again. Oh My Goodness! This is the first I've learned of any DVD issues and will attend to it immediately. I will also look into more convenient venues for movie viewing. I'm delighted you enjoyed the condo and must say much thought has gone into making it a comfortable and pleasant experience. Consequently, it is an understatement to say it's nice to know it has not gone unnoticed. My sincere thanks.